It's time to congratulate the winners! The winning stories will be published on EssayMama Blog if the winners give their consent. EssayMama will start a new writing contest on Fabruary, 9. Stay tuned. Look for updates on our website or on the social pages. More opportunities, more cash, more publications! Three final winners will be announced at January, 30, Friday. All the works are great! We did not expect that there will be such a huge amount of worthy stories! Tomorrow we will post the list of the works that will be added to the printed "Best Essay Mama's Stories: Christmas Edition" book. Due to the huge amount of great stories three final winners will be announced at January, 30, Friday. Sorry for this inconvenience, we just need more time to review all of your brilliant stories. P.S. : We will not publish your works without your permission. P.P.S : Soon we will start a new contest! Follow our updates here or on Facebook page. Thank you for participation, The final results will be announced January 21, 2015. We want to inform you that the deadline was changed because of the large number of people willing to take part. Christmas is fast approaching and Essaymama is here to treat the most talented writers with great prizes! With what do you associate Christmas? For EssayMama there are Christmas decorations, flashlights, frosty smell of pine needles and of course "A Christmas Carol" by Charles Dickens. Christmas gives us inspiration; you just need to add a little motivation and effort! So, (attention! 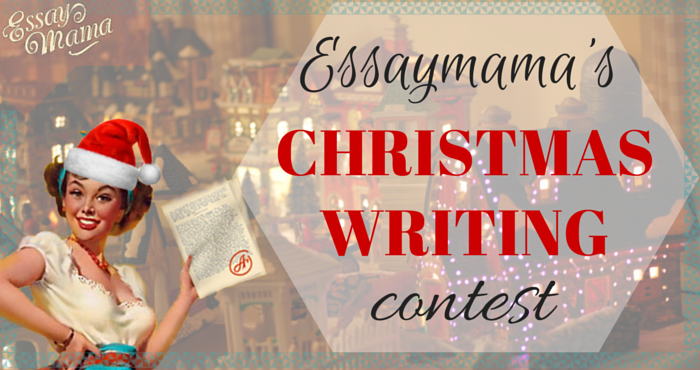 ), EssayMama writing service announces Christmas Writing Contest! Yes, exactly. This is a great opportunity for all talented writers to express themselves. Get published. Fame and popularity! 15 best works will be added to the printed "Best EssayMama's Stories: Christmas Edition" book and published on the best resources for writers. Deadline - December 25, 2014. Submit your stories from November 5 till December 25, 2014. Entry Fee $ 0. Just "like" Essaymama Facebook page and share on your own Facebook page the post about Essaymama Writing contest. Link to your shared post on Facebook is the 'entry fee' to the competition, so do not forget to add it to your letter! Additional Prizes. 15 best works will be added to the printed "Best EssayMama's Stories: Christmas Edition" book and published on the best resources for writers. Every winner will get his/her own copy via mail. Christmas dreams come true - you will become popular! Topic Christmas. The story can be written in any style - instructive, funny, sad, for children. The main thing - it must be about Christmas. Have any questions? Feel free to contact us via mail or Twitter/Facebook pages.